Hope ya'll had a wonderful weekend! Ours was pleasant and even though it called for storms on Saturday the day actually was sunny and beautiful. My hearts and prayers do go out to those effected by the terrible storms that passed us by. Okay ladies, I have been debating on our guest room / mother in law suite. I need some feedback. What I thought that I was doing I am now thinking of changing. Back in the fall I purchased this Country Living bedding from Kmart. My original thinking was to paint the walls blue like the pic and maybe eventually add the board and batten. We have a headboard we made from a door and I was going to strip it form the pinky mauvy color it currently is and paint/distress it black. I was going to go with a blue/black/white theme. Then I started thinking how expected that is and how more imaginative it could be. 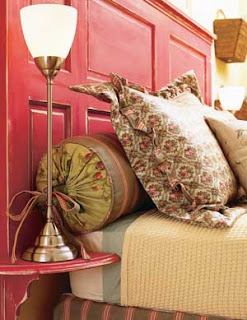 I am now thinking of painting the headboard red like this one!? That way the pink mauvy color does not need to be stripped but I can call it a primer.Ha! The bedding has to stay the same because at this time I just do not have the funds to redo it totally. So now I want to find a throw/blanket in yellow to lay at the end of the bed. 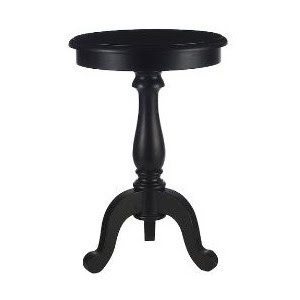 I have a Better Homes & Garden table almost exactly like this as a side table and then a white cottage looking table that I use to have in the nursery on the other side. Do you think it would all flow and has the possibility of looking like a welcoming comfy french country cottage chic retreat?? Not so sure about the wall color either. Should I go blue as originally planned or a light yellow or a creamy antique white? I am planning on accessorizing with a white rocking chair again from the old nursery and doing a plate display on the wall. I also hope to find some old vintage trays with flowers painted on them. I have seen them around blog land in black and some even in red! I have been on the hunt but no luck thus far. I also am on the hunt for a china cabinet that I will do in a distressed black. I will take out the glass and replace with chicken wire and a fab behind that. It will go on the opposite wall as the bed and be a place to store some clothes of our guest and hopefully a small flat screen TV. What kind of curtains should I do?? I was going to do white sheets hanging from vintage hangers. Now with the color change not sure that will look right. I am hoping to start on the transformation this week. Also whatever I do will have to spill over into the adjoining bath. That inspiration will come from the bedroom. So ladies let me know what ya think!??? You are asking the queen of loving red anything, so you know my vote :) I totally "see" your vision and I think no matter what you choose the room will look beautiful!! The only thing I'm not sure about is blue on the walls with the red bed. Could you refinish the bed then paint a piece of cardboard and place it behind the bed for a visual? I used to have a room in Mindy's house. Used to. Now she's filling up her bedrooms with children, can you imagine? lol....I'll be in the office/study/guest room. Ha! Do a sample on a piece of cardboard is way too easy and makes way too much sense Marla! ;) I already have some blue up on the wall. Actually been thru three colors thus far since I started on it back in the fall. I say follow whatever excites you! Based on the other things you have shared in your blog, I am confident it will look great!! Look forward to seeing what you decide.